Thanks, Erin! An excellent walk through! Amok varies from place to place, house to house. I've had it like this (very much like a hor mok) and I've had others that were saucier, and others that were more like soups inside a coconut. Maybe we need an amok cookoff? I better get back in the kitchen before Yoonhi catches me out here. Frizz Restaurant where Erin did her class has a nice little website with menus, discussions, and recipes! Okay, call it what you like, this is Luk Lak (Which immediately sends my family off into Klingon impersonations, I'm sorry). It's a two step dish. One, the marinade. Garlic, ginger, lemon grass, and onion. But, first, you need prahok. Where do you find prahok, you ask? Good question. The fermented, pasty, smelly fish stuff of Indochina isn't something you just pop into the corner grocery and pick up. Phia Sing's Traditional Recipes of Laos was prefaced and commented very well by the Davidsons. In there they point out that many a Lao who's ended up in the West has been surprised at their first taste of canned anchovies. "This is paa dek!" 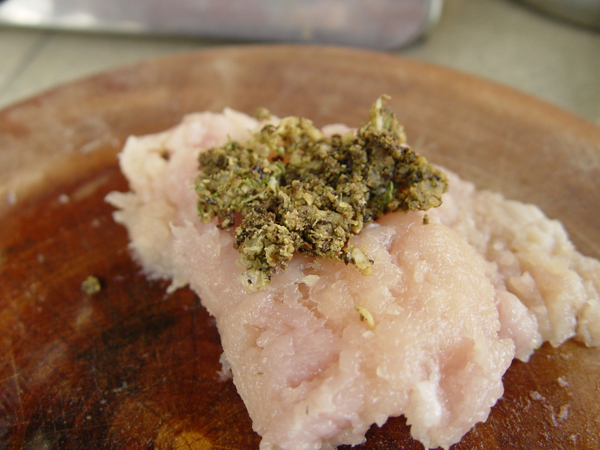 So, we start by pounding down the anchovie to a paste in the mortar, and then add in the other ingredients above. Once they're beaten up enough, I transfer them to a bowl, add salt and sugar, and dump in a bunch of limes. 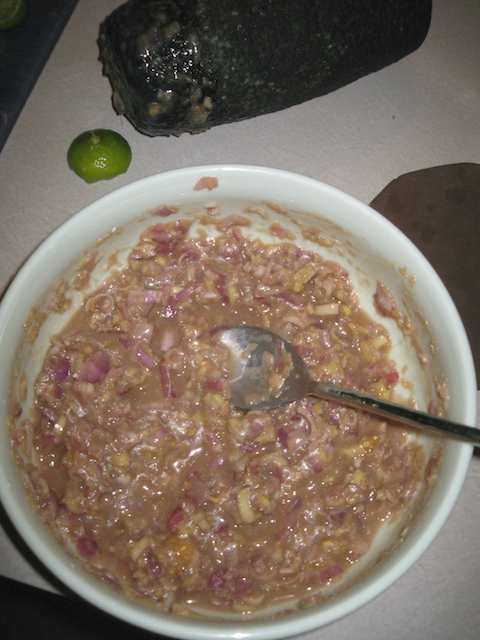 Then the meat goes in the marinade, and the limes work their magic on the meat. 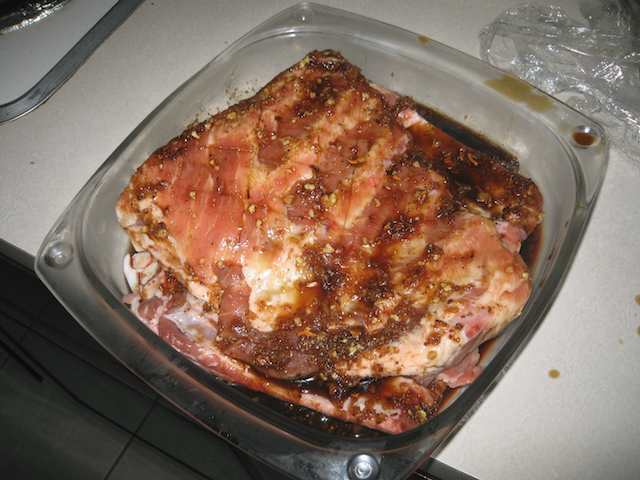 The meat sits for an hour in the marinade. Now, the plan would have been to separate the meat from the marinade, and then reduce the sauce to a thick gravy to be poured on the carpaccio of beef. Unfortunately, Yoonhi has this thing about eating raw meats I prepare. So, as a compromise, I very lightly sauteed the meat so it was red, but not raw, and then separated the meat from the juice, and reduced it to get the gravy I wanted. The meat was mixed up with coriander, mint, and cucumbers (I didn't use the peanuts or green beans), and then the gravy was drizzled on. 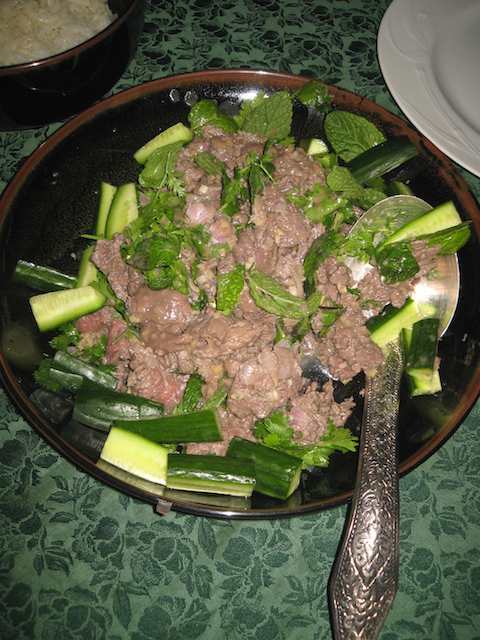 If raw, it would've been a lot like the buffalo tartare ( laap krouaille) we'd had in Luang Prabang last time. As was it was almost dead on for the luk lak I'd had before in Penh (which was cooked for Westerners, rather than served raw). Khmer Surin on R. 357 was always good for this. Nice gravy, though. (And Yoonhi liked it, which is important). Oh, I love luk lak! But in Vietnam it always came in a tomatoey sauce..And big fat potato chips, of the British variety, on the side. Huh. Yes, I can't recommend that cooking school enough, if anyone's in the neighborhood. they have an open-air kitchen overlooking the Mekong. Everybody gets their own cooking station, and you eat everything you make. I can't think of a nicer way to pass an afternoon. Hrm... so amok is like the Thai haw mok except not ground and less spicy. Interesting. It is very much like that. I've had Thai haw mok that isn't ground, too, but it was white, and less spicy than the red haw mok that's ground. 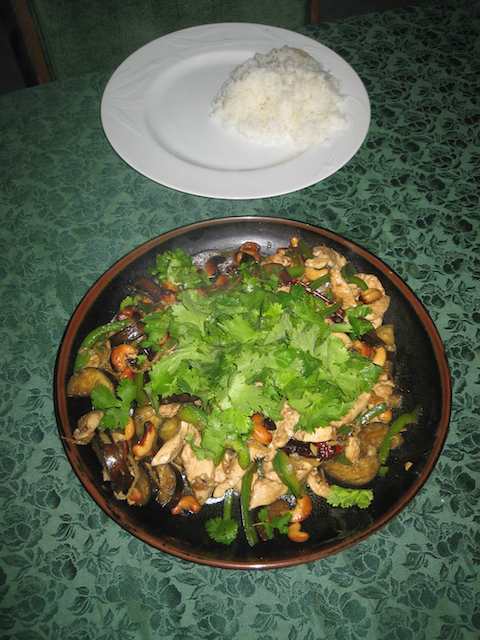 As Joannes says in introducing this dish, amok is the national dish of Cambodia. There are almost a limitless number of recipies, and you'll find these same ingredients in "soups, stews, and savory flans". The first, most important part as Erin already illustrated, is making the kroeung, the curry paste. The oil is heated in the wok, and then all of the ingredients are fired up to a golden brown. This is a tough call for me, as the turmeric imparts that tell-tale yellow so quickly that I go colour blind (or at least monochrome). Man, though, that smells good when the ingredients all hit the hot oil. The amok itself is pretty easy. I don't have the traditional nonni leaves, but the book recommends Swiss chard as a substitute. 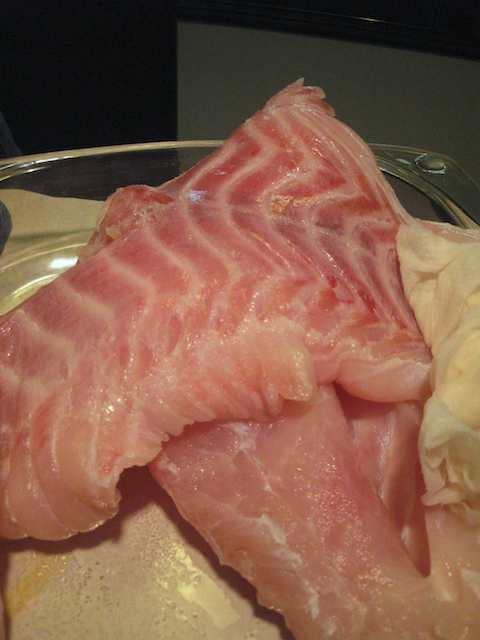 I've picked up a hamour (grouper) which I like for the firmness of its flesh. 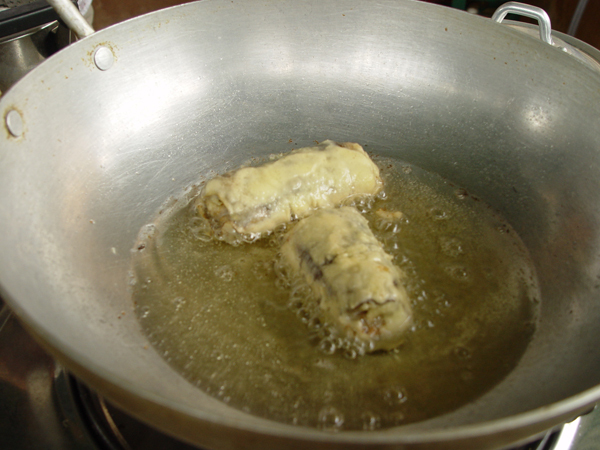 We heat another 3 tablespoons of oil in the wok, and then add the kroeung and fry it up to brown. Then we add the fish, and then the Swiss chard. Let the greens wilt, and add coconut milk, a teaspoon of palm sugar, and 4 tbsp of fish sauce. Portion it out into some coconut bowls (at last, I can use them for something besides mojitos), and top with a bit of the coconut cream. The flavour is a treat for Yoonhi. "There's something nutty in this." It must be the krachai. 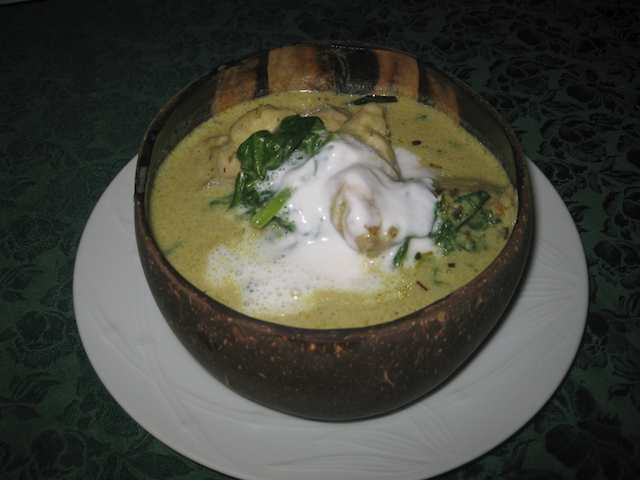 Smooth coconut broth, and nice, just cooked slices of fish. This "stew" version is fairly close to the first amok I ever had way back when in Siem Reab. If I was to do this again, I'd probably add a handful of basil at the finish to wilt in. If I could get fresh coconut to serve it in (with the white flesh to scrape out) that would take me right back to the flavour I remember. 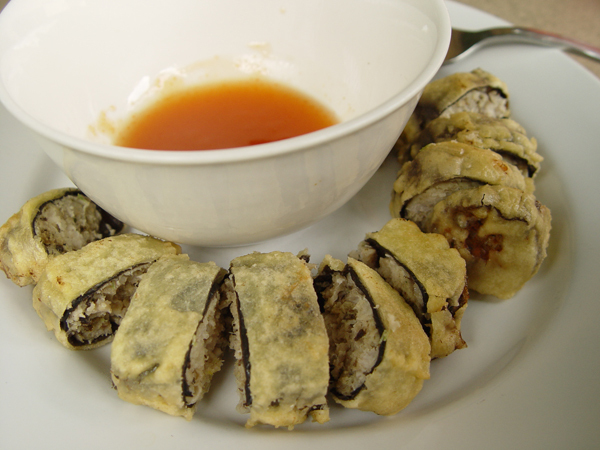 I can do this again (but I also want to try the hor mok version, too, now that I've got spare kroeung around). I just went looking for a WGF reference on turmeric to add in for the last post, as it's a very interesting ingredient. But, that was WGF 6 in Bangkok, and I didn't start posting until WGF7 (the earlier ones I just bored my close friends. Now I bore everyone). "Our other spice topic was turmeric. My main reaction to turmeric in the past has been an interest in the alacrity with which it manages to run through my system and come out my fingernails, making me look even more jaundiced than usual. But, it appears, turmeric is the new wonder drug. It is one of the best disinfectants, killing all surface bacteria, and also a coagulent. 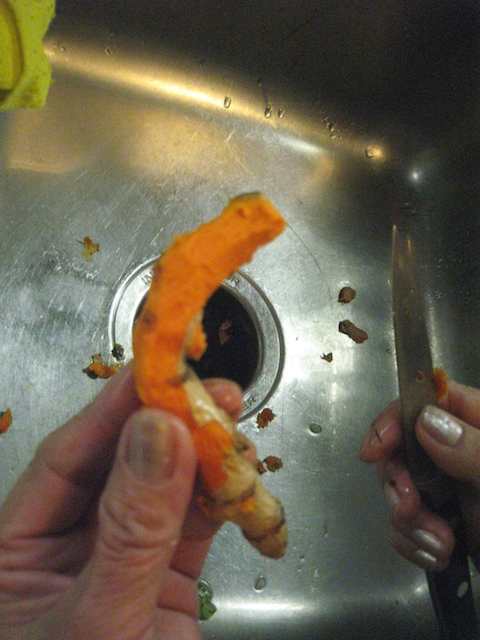 When Cyrus cut himself on a knife awhile back, a quick dab of turmeric cleaned and clotted the wound quite nicely. Talking with some of my Thai friends about this later, they agreed, it was an old folk remedy to rub turmeric on a wound. Likewise, if a child is hurt, they’ll feed them turmeric in a drink, to address possible internal injuries. A jar of turmeric is also standard issue in most Indian autos, acting as a sealant for radiator failures. In breaking news, Cyrus noted that new research from the US indicates that it can stop the spread of breast cancer cells. Coming back to cooking, it turns out that it is not only important for the colour it imparts, but also, as a coagulent, it will thicken the dishes in which it is used, working from the bottom up." And that last bit helps to explain the thickening I found in the broth, without the normal aid of cornstarch or other items. This would also be the primary item in chu chi curries, which always come out with that wonderfully gloppy texture and colour. And now, back to our regular programming. I thought amok was steamed like haw mok? It's more of a curry? Or did I miss something? Fresh turmeric is still very hard to find here. It wonderful fresh. Ah, there's the rub! Amok seems to be more the combination of flavours - kroeung, coconut, nonnsi leaves. What you do with it is your choice, and you shouldn't feel confined to any one path. There, my new thesis! The Tao of Amok. Isn't that funny? According to my notes, there's no turmeric in my kroeung, but if you look in my picture of the ingredients, you can clearly see a little nub of it there. I have never found fresh turmeric outside of Vietnam, but if I was anywhere near some, I'd snap it up. It has a much better taste than the dried. It's one of those things that's never there until you look for it. Once I was aware of it, I kept finding it in the markets all over Bangkok. I always drag some back with me now. 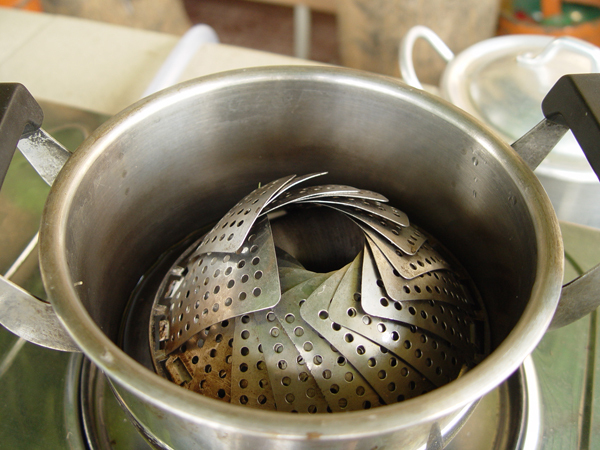 My former landlady [from Cambodia] used to cook something she called an amok that was like Peter's and unlike the leaf-cup type I have cooked for my Lao boss in his restaurant [with dill, not lime leaf]. She used to make a huge bag of blackened red pepper flakes, minus the seeds, during the warm months. 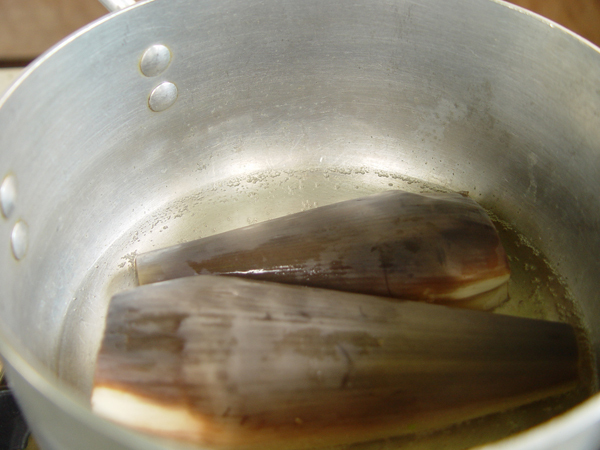 This she would use liberally during the middle to last stages, after adding the coconut milk. So: oil, paste, fry, then stuff, then coconut milk, then a huge fistful of the blackened flakes [enough to turn things a murky grey], then cook some more. Some northern Thai use blackened pepper whole pepper, either fire-roasted or fried until the skin is almost about to disintegrate, so do the Burmese, so do Indians, but never in such quantity that I know of, and never minus the seed (?). The flavor here is different from Chinese use of blackened pepper much like very dark Cajun roux is to the merely very brown. Has anyone seen or tasted this flavor combination? BTW, landlady was extremely coy & secretive about her kroeung, so no luck there!! But really delicious. If you have even a tiny plot of land, grow it. 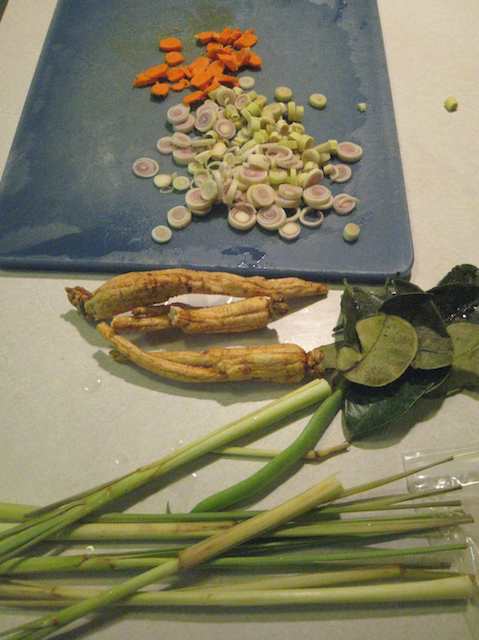 When I was living in rural Malaysia, there was some growing in an approximately 4 foot x 4 foot (3.25 meter x 3.25 meter) plot of soil outside the kitchen area of the house we were renting - along with ginger, sweet potatoes, hot peppers, and probably some other things I've forgotten. I don't think it required anything but rainwater that naturally poured onto it from the heavens. Edit: Oh wait, you're in Iowa, aren't you? Scratch that. I think it requires a tropical climate. Back to the good-looking luk lak (here in Providence you'll see it as loc lac). I've never seen it with tomato sauce. Erin, do you mean with chunks of tomato or a pureed, reduced sauce that includes tomatoes. I have never found fresh turmeric outside of Vietnam, but if I was anywhere near some, I'd snap it up. It has a much better taste than the dried. Fresh is pretty common in SE and South Asian countries, but at least with Indian recipes, I've mostly seen dry turmeric used. Here it's often available frozen in packets buried in one of the chest freezers at SE Asian food stores. I should have been more clear, sorry. I was being really self-involved. I was thinking of the places where I have lived, Vietnam was the only place where I was able to find fresh turmeric regularly. Turmeric is widely available in SEA, yes. Sadly, not Northeast Asia. I can't justify the trip into Tokyo just for fresh - I wonder if dried could be satisfactorily substituted into this recipe? I'll have to try. Separate out some petals from your banana flower. 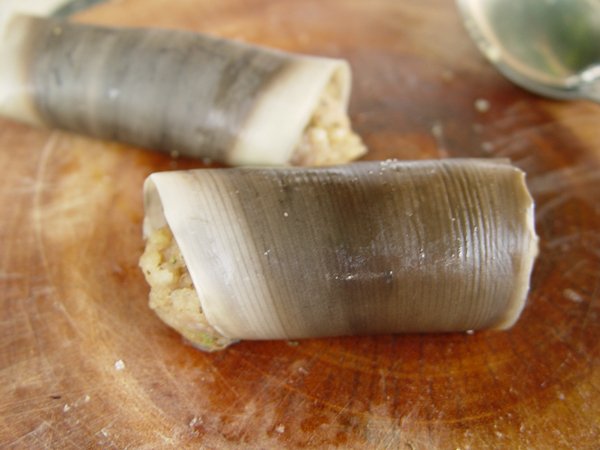 Boil them briefly so that they are supple - about a minute. 1 tbsp. 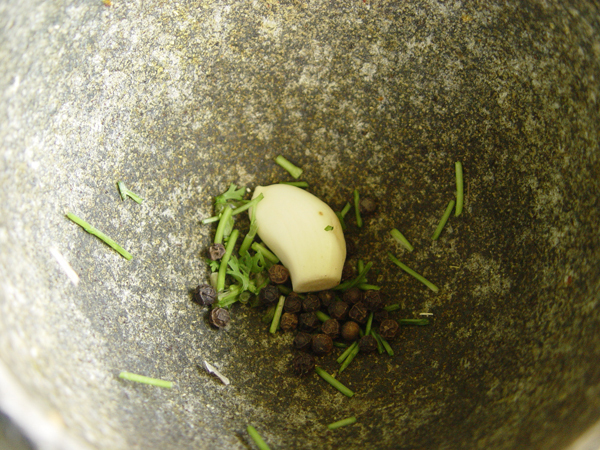 each of salt, pepper, sugar; two cloves of garlic, and some cilantro stems. 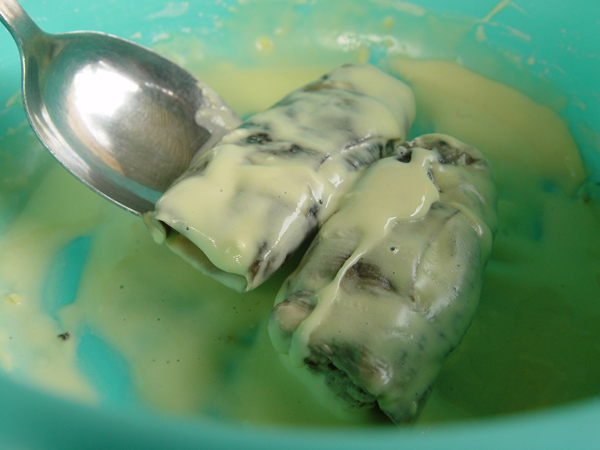 Then form into little logs, or "quenelles". Then steam for fifteen minutes. 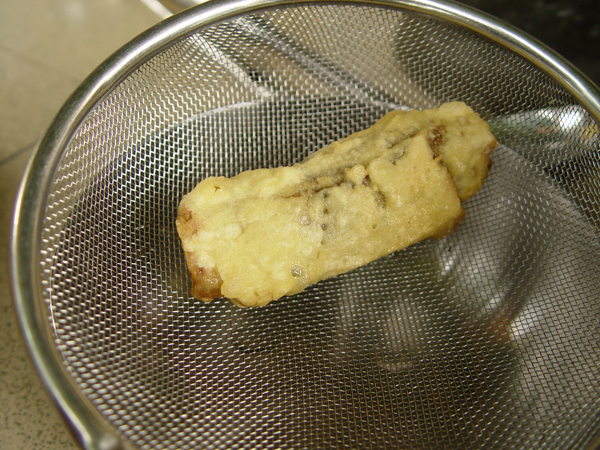 Make a batter of one cup of water, one egg yolk, and three tsp of flour. Dip your steamed sausages into the mix, and fry in your wok in vegetable oil over medium low heat for five minutes or so. Slice, and serve with a little sri racha thinned with soy sauce. Oi xoi oi I'll have to go digging through my Vietnam pictures. But I feel like it was more of a sweet-sour sauce based on tomatoes. Okay, I'm going to buy some banana leaves when I get back. 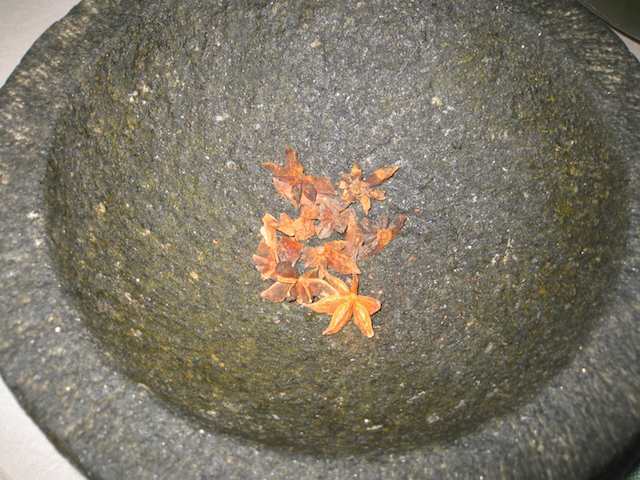 Now, star anise cries out to me of Vietnam, particularly South Vietnam (as opposed to the North). I wonder if this is something Cham in origin, but the pork cries out for Chinese merchants. You Vietnamese experts out there! What's your opinion? First we prep a marinade. Star anise first (about half a dozen, pulled out of the stash), and then garlic, palm sugar (you can also use honey), and soy sauce. Mix that up, score the ribs, and let them sit for a couple of hours. After the chicken, I decided to rely upon the smoker. Especially given that we're doing ribs, and I don't want to mess up something so precious. I let them cook for four hours, topping up the water as we went. Part way through I tossed in some chicken wings that I had in the marinade, too, as Yoonhi said we needed some vegetables to go with the meal. The results were mixed. The ribs were good. Moist, with a hint (but only a hint) of anise in the background. But ribs are (almost) always good, so had a made a wise decision? 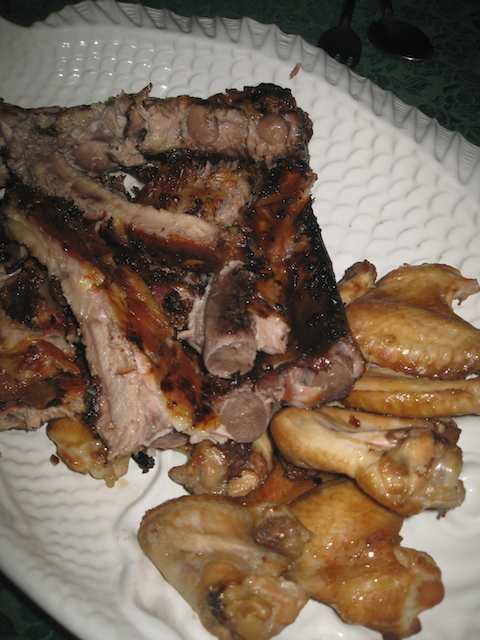 I'd have to say, the Chinese recipes I have for ribs are probably better. But this was okay. And the chicken was quite good. I could do more chicken like this (And I probably will). P.S. - Yoonhi is still arguing that chicken isn't a vegetable, and insisted we put some green beans on the table. Iowa has sufficient DEGREE DAYS to grow fresh turmeric between May through early October. You will get a decent harvest, perhaps 2/3 the full monte. Same with galanga, and mango ginger, another very interesting creature to be found in the Indian stores mentioned below. You can get the fresh rhizomes in NYC or CA stores, and have them sent to you. Pan is an expert on NYC Queens and knows where everything is to be found. Maybe he might oblige? All the Indian stores like Patel Bros. & Sabzi Mandi have them. Not expensive either. Start them in 4 inch pots right away if you want. Potting MIX, not potting soil. Make sure of this. Any brand is fine. Then transplant them outside, usually 15th May around Ames is fine. Grow good sweet potatoes in Iowa, KOREAN PURPLE & VIOLETTA from Sandhill Preservation Center, Glenn Drown, prop, Calamus, IA. Cook with these in Asian dishes to appreciate the difference. This is definitely Chinese. Dried chilis and oyster sauce. We start off soaking the dried chilis. The book says to remove the seeds, but after a few days of this, I'm beginning to crave heat in my food. Next, out comes the stir fry gear. 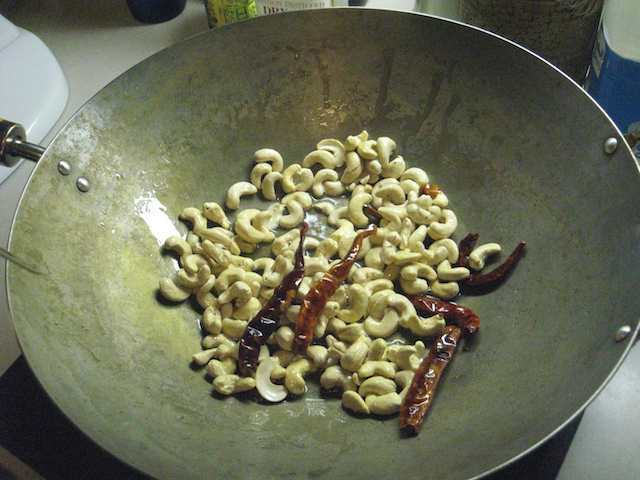 Some oil into the wok, the MI cranked to the max, and I sautee cashew nuts with the dried chili. Our housekeeper flees the kitchen, coughing. After the cashews go golden, I put in the ginger (shredded) to cook a little, and then add a good dollop of garlic, and my shredded chicken breast. The book does advise, for stir fries, to cut the meat as close to the grain as possible so it doesn't dry out, but we couldn't find any boneless chicken breast, so we ended up shredding, which, by its nature, is going to be as close to the grain as you can get. 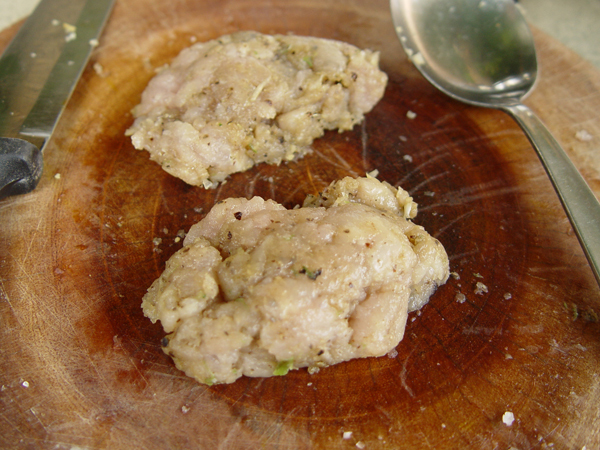 This cooks until the chicken browns, and then I toss in sliced eggplant and strips of green bell pepper. Cook for 2 minutes. Now it's time for the sauce. 4 tablespoons of oyster sauce, and 2 tablespoons of soy sauce. Reduce that a bit, and serve it quick with a crown of coriander. Biting into this, it's pleasant, and recognizable....barely.....I'm distracted by the eggplant, which I should have slice and quartered, rather than halved, which would have cut down on the skin, while leaving enough there still to give some contrast. And then Yoonhi and I look at each other and say "kung pao chicken". It would've been kung pao chicken. Yoonhi had to restrain me from getting my Sichuan peppercorns out. It's different enough, but still nice. The chili gives a nice warm burn around your mouth, without overpowering, and the cooking of the ginger as a shredded vegetable is really pleasant. Plus, Khmer style, you get a big nose of fresh coriander. The oyster sauce would have come through the coastal trading routes, but the dish itself suggests a migration down the Maekhong. 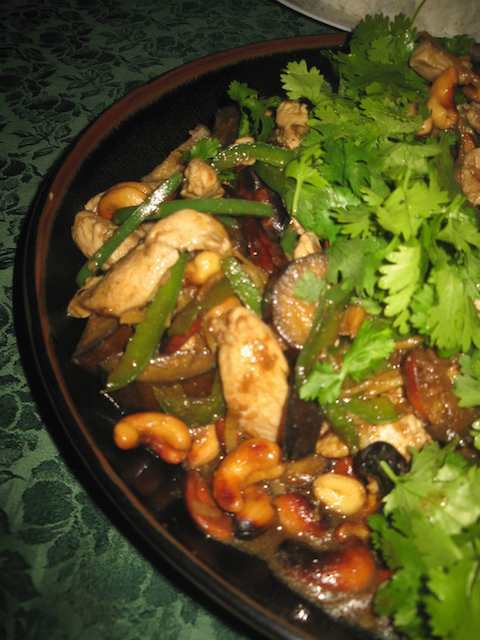 Now I'm interested in going back to my Kung Pao recipe from Chengdu, and reworking things with a mix of this technique and those. Life is too short for all the things we need to eat. "Life is too short for all the things we need to eat." Okay, this will be the last Khmer meal for a little while. The recipe calls for fresh baby squid, but I'm making do with the teenagers I found in the freezer when I went hunting for my krachai the other day. They also want green beans, trimmed and sliced, but I've got some snow peas, and I prefer those. This is a relatively fast one. 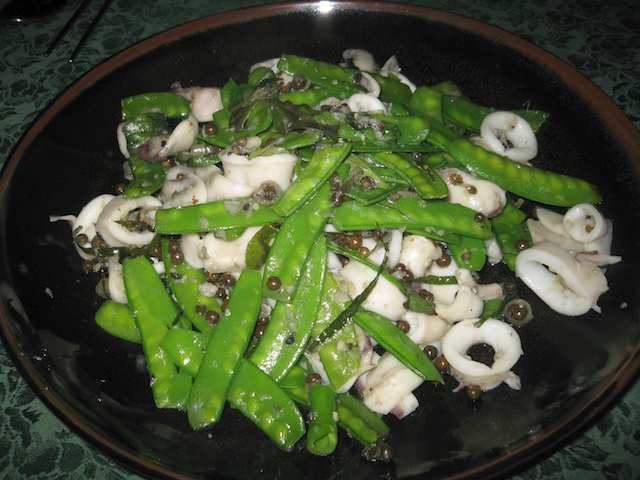 First, we sliced up our squid, chopped the bottom 1/3 of 2 stalks of lemon grass, secured the garlic, juliened 5 kaffir lime leaves, and went hunting for the Malagassy green peppercorns I had in the fridge (many of you have seen my fridge.....it's not pretty). 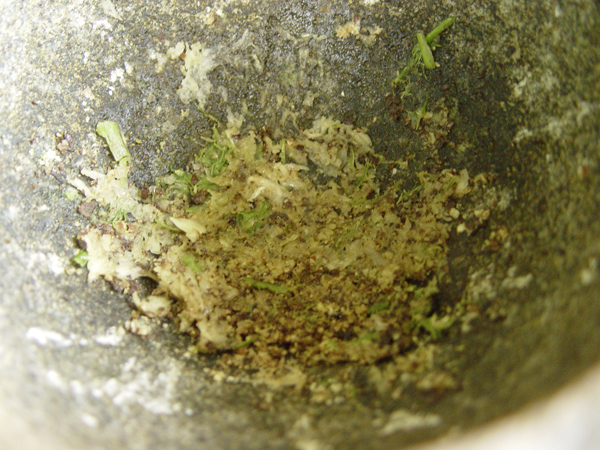 I've still got some palm sugar ground up from the first day, and Yoonhi swiped a handful of basil leaves from the neighbor's bush. Slap the squid into the wok on medium high mag induction for about 30 seconds, until it gives up its water. 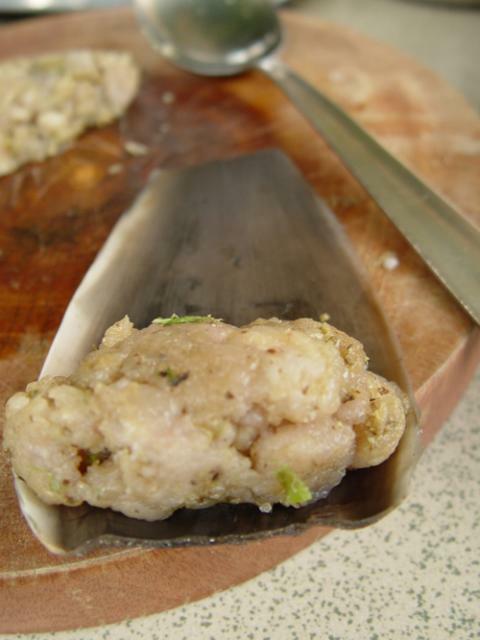 Remove the squid, bang in 3 tbsp of oil, and add the lemon grass and garlic. Stir fry for 1 minute. Then add the snow peas, kaffir lime leaves (ah, that smell), and then the green peppercorns and stir fry for another minute. Then put the squid back in, add the fish sauce and sugar, and stir fry for another minute. Rip the basil up, drop it in, remove from heat, and serve. The squid is pliant, but still with a bit of crunch. The snow peas are all crunch and sweetness. And the peppercorns lend a slow rohn pet - peppery burn - to the dish (and they're fun to bite). And that blast of fresh basil smell is always a good thing. You ask me about this dish, and it's more original Khmer - that thread of jungle dining using the basics of what you can find about you in the back of beyond. Herbs, spices, and a bit of meat.